We offer a total of nine different ways to pay for an order. 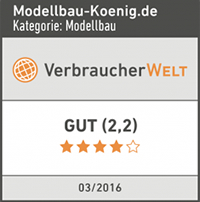 Modellbaukönig GmbH & Co KG reserves the right to accept only certain payment methods in individual cases. First time customers can not order by direct debit or on invoice. This option is only available to existing customers, with a German billing and delivery address. We currently accept credit cards from VISA and MasterCard to pay for orders. Your credit card will be charged when your order is triggered. If you have an account with the online payment service PayPal, you can also use this to pay for your order. Please note that your PayPal account will be charged immediately during the order. If you do not have a PayPal account, you can open it during the order process. Important: Please do not send any amounts to us independently via the PayPal platform. A PayPal payment is only possible via the same option during the ordering process in the online shop. Such Transactions will not be considered or accepted. You can pay conveniently via Bank Transfer. You will receive the IBAN and the BIC after order completion. As soon as this is received by us, your order will be shipped to us (insofar as all items are available). Our account details will be displayed in the shop immediately after your order. In addition, you will also find them in the order confirmation, which will be sent to you by e-mail. As purpose of payment, please indicate the order number and your Customer-Number. This option with a German billing and delivery address. Use your deposited with Amazon payment and shipping information and pay in our online shop via Amazon Payments. You will need your Amazon credentials and will also benefit from Amazon Buyer Protection here. Do you have more questions? Then just write us a message. We will contact you as soon as possible.